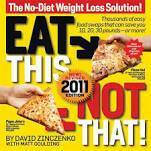 I bought Eat This, Not That by David Zinczenko and Matt Goulding. The cover says "The no-diet weight loss solution!" and I was thinking this could be the key to losing ten pounds. Not only has it sold more than eight million copies, it's become a franchise: Grill This, Not That; Eat This, Not That No-Diet Diet; Cook This Not That 350-calorie edition; Drink This, Not That; well, you get the idea. There's a new one from 2011. I can't imagine anything's gotten better. The boys made a list of 10 foods that look healthy but they're not. Four things you don't want: a Quiznos large vegetable sub with cheese and oil (1,000 calories and 54 fat grams); Boston Market All White Chicken with mayo and oil (1,050 calories and 64 fat grams); Red Lobster lobster, artichoke and seafood dip (1,200 calories and 74 fat grams); and a 40-oz Smoothie King cranberry supreme with 1,108 calories and 192 grams of sugar thanks to "carbohydrate mix." Since I don't know what carbohydrate mix is I went to their website. I didn't find it. Anyway, 40 ounces of anything is more than a quart. A smoothie, for heaven's sake. The 20 worst foods in America: Pepperidge Farm's Chicken Pot Pie is "the worst supermarket meal" with 1,020 calories and 64 fat grams and On the Border's beef taco salad is the "worst salad" with 1,450 calories and 102 fat grams. There are 18 others plus an 800-calorie cinnabon roll that will put you off glazed forever. Then I thought, this was the key to weight loss. Read the list, look at the pictures and your throat closes up. It worked at first. After you get to the things you can eat, what I call the insteads, I checked the kitchen to see if any insteads might be there. No insteads and not much of anything else except greens. I like their "menu decoder." In a pizza place, no starters since "they involve a vat of hot oil" and no hoagies/heroes/subs with lunch meats, mayo and oil. Sushi bars are okay except for house salad and spicy tuna rolls (mayo in both). If it's a BBQ, all you can have are peel 'n eat shrimp and chicken. For seafood, nix the oyster stew, fried anything, tartar sauce and swordfish. There's something addictive that keeps you reading. (Maybe because it's small format and nearly all photos. . . of things you may have eaten.) At bistros: no-no's are onion soup (cheese), confit (cooked in its own fat), steak frites and crème brûlée. With Asian, no tofu (it's a sponge "sucking up" oil), no crispy anything, no fried rice, and no iced tea (sugar and condensed milk). Curry is okay (except for coconut milk) and so are summer rolls. Restaurants they cite by name are chains. Even if they're not yours, the data translates: mayo, fried, dressings, sugar and salt. They were ahead of their time too. Michael Moss's Salt Sugar Fat: How the Food Giants Hooked Us is new. Frankly, there can never be too many reminders to look out for salt, sugar and fat. With all the things I am not eating, pounds are not flying off. Still, I recommend this book for when you can't sleep. Read what you want, wrap and save for tomorrow. I was thinking, if there were books like this when I was writing book reports for grades, I might have gotten in to . . . my favorite skinny jeans. NOTE: In the summer of 2017, the Cheesecake Factory menu had calories listed next to everything. You couldn't miss it. Though we don't know how long calories lasted on their menu, maybe a minute, they're gone.